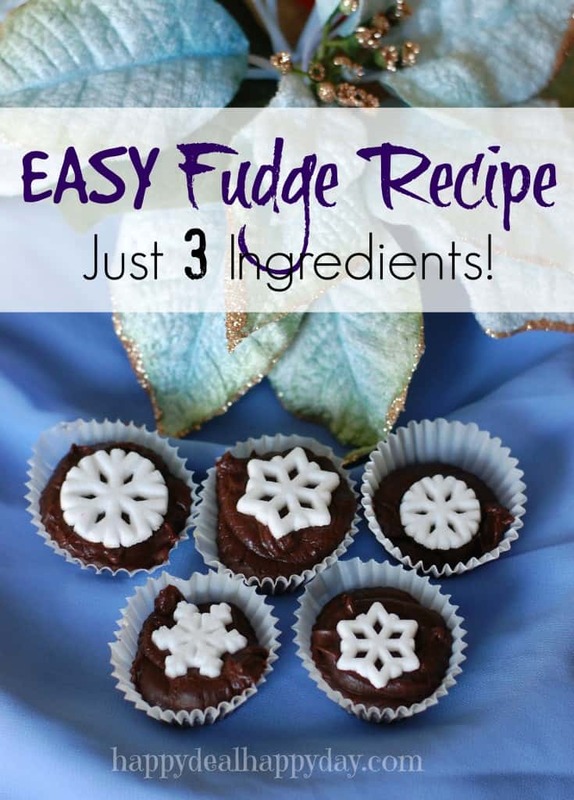 Fudge Recipe - Easy 3 Ingredients! | Happy Deal - Happy Day! Here is a super EASY way to make some very rich, chocolatey, yummy fudge! Use a mini muffin pan, and line a dozen slots with mini cupcake holders. Spray them each with some cooking spray. Put 2 cups of chocolate chips into a mixing bowl and set aside. Heat up the coconut oil and coconut milk into a sauce pan until boiling. (be sure you shake your can of coconut milk well to get the extra fat. You don’t want too much liquid in these or they won’t set, as I found out the hard way.) When it is boiling, immediatly pour over the chocolate chips. You can let this mixture sit for a minute or so to start the melting process, and then stir it all together until smooth. Scoop about one heaping tablespoon of chocolate into the mini muffin liners.
. It was nice because this came with 12 snowflakes, and this recipe makes about a dozen of fudge bites. You can easily substitute the topping for a colored sugar (depending on season or holiday) or even just a bit of sea salt. Set these in the refrigerator for a couple of hours until set. You can serve them cold or at room temperature. These make for a nice party favor or an easy dessert to bring for your Christmas, New Years, or Super Bowl Party!! Looking for other holiday desserts? Check out these Chocolate Covered Oreos! Fudge Recipe - Easy 3 Ingredients! Heat up the coconut oil and coconut milk into a sauce pan until boiling. (be sure you shake your can of coconut milk well to get the extra coconut fat. You don't want too much liquid in these or they won't set at room temperature.) When it is boiling, immediately pour over the chocolate chips. I like to top mine with these Assorted Snowflake Sugar Decorations Disney Movie Frozen Party Favors Cupcake 12 Count (found on Amazon.com). It was nice because this came with 12 snowflakes, and this recipe makes about a dozen fudge bites. ← Pampers Jumbo Packs only $4.50 at CVS!